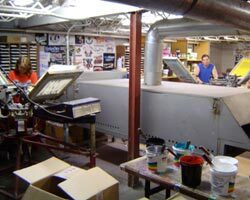 We have an on-site custom silk screen department inside the Fridley store. Our screeners have 20 and 26 years of experience. We print up to 6 color logos from full front to crest size on most any garment. We also print numbers 1 or 2 colors from 2" to 10" and stencil names. Bring any concept you have in or look at our stock designs to create an exciting piece. 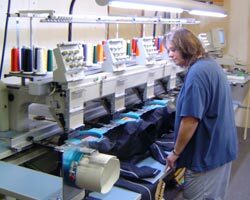 We have had our embroidery shop at the Fridley store for over 6 years. We embroider up to 9 color logos. Choose a stock image and add text or have a custom logo digitized. We can letter most garments including caps. We will also personalize pieces with names or numbers.